Breakfast at Persephone Bakery, the much-acclaimed, highly stylish boulangerie and café in Jackson, Wyoming, is pretty much all it’s cracked up to be. Old-town shabby chic, and housed in what appears to be a Victorian single-storey wooden building, Persephone is nestled amongst towering trees, just a few steps off the main square. But before we tuck into breakfast, a few words on what brought us to this stunning part of the world in the first place. I’m embarrassed to admit, that in my 20 years of living in the U.S. I have barely touched-down in the middle of the country. A couple of business trips to Austin; Dallas years ago, and that’s about it. So when my dear yoga teacher, Stephanie Snyder, announced she was going to be teaching yoga at a horse ranch in Wyoming this summer, I knew it was a sign from the universe to rectify this state of affairs. I mean, horses and yoga and big open spaces… what else is needed for an amazing vacation? I decided to make the most of our journey to this hither-to unexplored state, and booked a few extra days in and around Jackson Hole. As usual, I started to friend-source tips on great places to eat, and Persephone Bakery came up a number of times. So on morning #1, bleary-eyed from a late-night arrival and without any sense of our bearings, I plugged Persephone into Google Maps and followed the directions blindly. And what a soothing place for the soul and senses this little bakery is. Don’t be put off by the line at the door, it moved quite quickly. Grab a menu to peruse as you enter and if you can possibly make up your mind, your turn to drool at the counter will soon come. Pastries are flaky, sticky and sweet at Persephone. If you’re smart, you’ll grab a loaf of bread to take home and enjoy later. When I inquired about gluten-free breads, I was told that the locally milled wheat was generally better tolerated by those who found gluten tough to digest. Fresh baked loaves are available to take home. We opted for drinks, a cheese and ham croissant ($4.25) for Monkey and a traditional breakfast for me ($10.75). Sitting outside on the tree-shaded deck, savoring our breakfast and people watching in a slightly cool morning, was just a great way to begin our stay in Jackson. There are lots of thoughtful touches to the interior design, including the cubbies where you pick up your coffee order. Tasty cooked breakfast at Persephone Bakery. Once you’re done eating you can peruse the shelves of delights: locally crafted pottery, housemade ‘nutella’ and preserves. You’ll want to buy souvenirs for sure. 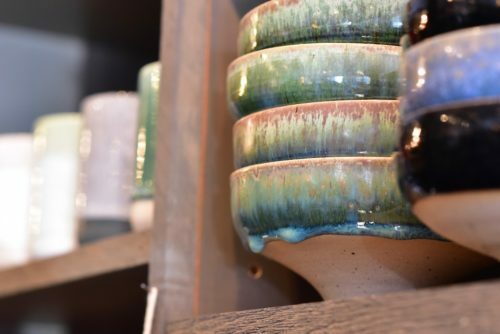 Locally made pottery adorns the shelves. You can find Persephone Bakery at 145 E. Broadway, Jackson, WY. Open until 6pm every day except Sunday, when the bakery closes at 5pm.